The best way to go to an adventure, backpack, camping trip or outdoor activity is to keep a portable shower for camping with you. You can use these for hot as well as cold water. Some showers are solar based while some uses battery. They are also affordable, easy to use & carry. If you are one of those people who love camping, a portable shower will absolutely be a great investment. However, you need to be very careful when buying a outdoor shower to ensure that you have selected a reliable product. 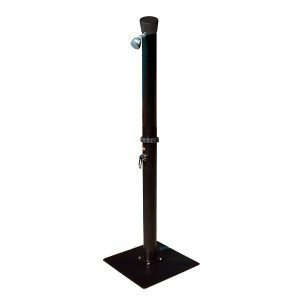 To make your work easier we have done a lot of research to come up with the top rated 7 portable showers for camping you can find today. Big Kahuna is another quality camping shower in our list. It comes in three different sizes to suit your requirements. Hot water stays Hot for hours since the container is Plastic and cold water stay cold. It is BPA Free as well, can be used for clean drinking water as well. Its capacity varies from 4.7, 8 and 13 gallons. The 8 gallon is enough for 3 persons, Wife, Husband, and a Kid. The first thing you will note is the rugged design which makes it suitable for camping. It is also among the best pressure controlled showerheads you can find on the market. In addition, it comes with an 8-foot coiled shower hose. Another thing you should note is that the lid is able to absorb UV light to warm the water. Moreover, it is easy to use and features an integrated patented water lid. Additionally, it comes with a self-contained 12-volt submersible pump. If you want to get an instant shower, you just need to add water. You need to plug into a standard outlet in a car. It doesn’t have that much pressure to wash the car. Nemo Helio Outdoor Pressure Shower comes as the first one in our list. It has 11-liter tank which uses sunlight to heat water. The tank is well insulated and as a result, the water remains hot for hours after heating. The shower easily provides warm water for 2-3 showers. You can stretch it up to 17-inches height. It is so compact that it would fit in a backpack. You will also find that it gives you ultimate control to the water pressure. It comes with a hands-free pump which provides strong water pressure just like normal showerheads. When fully pressurized, it can provide a steady flow of 5-7 minutes. It is suitable for camping, rafting trips, backpacking, adventure travel, and any other outdoor tour. You can use it for rinsing off gears, cleaning kid, pets, watering plants and wash dishes. Additionally, it comes with a carry case for easy transport. 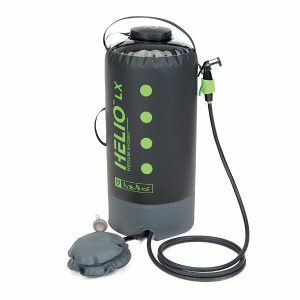 The whole unit comprises of a foot pump, 11-liter tank and a 7-foot hose which features a spray nozzle. The nozzle enables you to direct water in any direction. This works as advertised and is great for car camping. 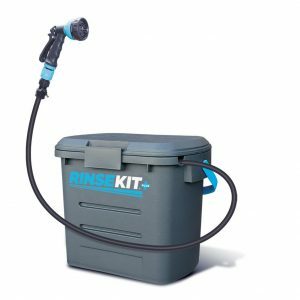 Rinsekit is another fantastic option for a camp shower. 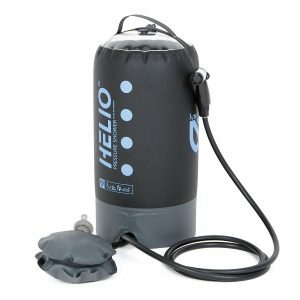 It is a great option if you are searching for a portable shower that doesn’t require batteries. It is BPA Free. It can be used for Camping, Surfing, Pets, Sport. 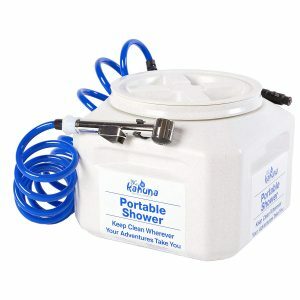 It features a 2-3 gallon tank and has a very effective nozzle which sprays for about 6 minutes continuously. Another noteworthy thing is that it is able to retain tank pressure for about one month. Additionally, it has internal storage where you can store your personal items. Its dual design allows the pressure booster pump accessories and the heater to be used simultaneously. The unit comprises of a hose bib adapter, hot water sink adapter, 6-foot hose, on/off valve, hose nozzle and a quick connect. If you are on a tight budget, Reliance Flow Pro will be a perfect choice. It provides a continuous spray through the trigger action showerhead. It is able to hold up to 8 liters of water. Moreover, it comes with a pressure release valve, unlike others. It also comes with a 6-feet kink resistant hose and a washable Neoprene sleeve. This sleeve contains a mesh which you can use to store extra items. This one is another top-rated shower on Amazon. It is a free-standing. The best thing is that it comes with a solar powered shower at the base. It uses no electrical cords, batteries, or other cords. It will last for 4-5 minutes with a hot shower. The shower is easy for one person to assemble. Additionally, it features a non-corrosive brass and PVC constructions. Due to these materials, it lasts for a long time. It can hold up to 5.5 gallons of water. You should also note that you can easily adjust hot or cold water according to your requirements. It works perfectly with a standard garden hose. Get it now from Amazon. This one is among the best portable showers you will ever find. It comes with a 22 liters tank which heats the water using sunlight. The tank is well insulated and as a result, the water remains hot for many hours. The other thing is that it allows you to control pressure using the hands-free foot pump. This pump also provides a steady supply of water for 7-10 minutes. In addition, it comes with a convenient carry case which makes it portable. You can use it to wash dishes, clean your kids, pets, rinse off gears or use it to water plants. 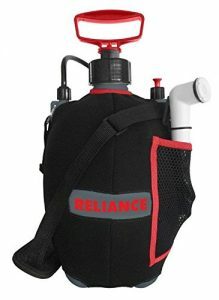 The whole unit comprises of a 10-foot hose which has a spray nozzle, 22-liters tank, carrying case and a foot pump. It is a bit expensive but it will give you value for your money. 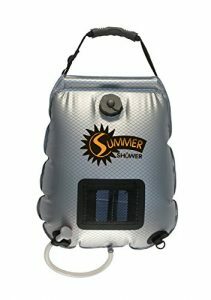 If you are searching for an advanced portable solar shower for camping, this one can be a great choice. it easy to carry. Unlike others, it is made of quality non-toxic PVC material. You will also find that it is very light since it weighs only 1 pound and 4 ounces. It is powered by solar technology which is great since it does not rely on power energy. This bag is able to hold up to 5 gallons of water. The best thing is that it does not allow water contamination with any chemicals from the plastic. This bag comes with a reinforced handle which transports the water. The handle also ensures that the water is safe when the bag is hanging. Additionally, it comes with easy to use on/off showerhead. Apart from that, it also comes with a very large filing valve. The other thing you should note is that it features side pockets where you can keep your shampoo or soap. Lastly, it has a temperature gauge and Velcro straps. Today there are so many showers for camping which makes it hard to determine the best. Below are some of the things you should look when buying a camping shower. Ease of use – It can be very frustrating when you are not sure of how to use your portable shower when camping. To avoid this, look for a unit that is easy to use. The design should also be great and straightforward. It should also be easy to install, refill and empty. Capacity – Most of the showers allow you to refill when they are empty. However, you need to consider the number of people who will be using the shower to ensure that you have picked the one with ideal capacity. Heating– Some showers rely on batteries or power energy to heat the water. However, they may not be the best especially when camping in remote areas. The best shower for camping should allow you to warm the water using sunlight. Weight –A good shower for camping should be easy to carry unless you are going to transport the shower with your car. Durability – It is good to think of places where you will be using the shower before buying. Some of the areas may not be very friendly. Therefore, ensure it is made of quality materials which will allow it to withstand harsh conditions. Reviews – It is advisable to go through the customer reviews on Amazon before spending your money on a product. This will enable you to determine whether the product will give you value for your money or not. We have included the product links to make your work easier when checking. How long does a solar shower take to heat up? Most of the standing solar showers can hold 10 to 15 gallons of water. These solar showers should last for at least 5 minutes. A flat panel or a tank can give you up to 10 minutes of shower. What is a solar shower bag? Solar showers have two parts. There are a showerhead and a container that holds water. A solar shower bag is a part or container that holds water. You just need to fill the bag with water and place it in an open area where there is direct sunlight. How do you use a solar shower? Fill the plastic bag with water and then place it in a place where there is direct sunlight. The clear top should face the sun. You can use a thermometer to check when the water has reached the ideal temperature. Most solar showers come with a thermometer so you do not need to buy. When the water is hot, hang the bag on a tree for a gravity fed warm shower. Always check the temperatures because solar showers can attain over 120 degrees. How does Solar Shower work? A solar shower usually comprises of a container that absorbs sunlight to heat the water. Some of them feature a black plastic bag which absorbs solar rays. These showers are convenient in remote areas where there is no electricity. They are also easy to use. A camping shower is one of the most important items you should always carry when camping. When buying, you will find that these showers are available in different designs and sizes. It is always good to look for a lightweight shower. You also need to look for a durable unit and one that can hold enough water for your family. The other important thing you need to check is the mode of heating. If you prefer to buy a battery-powered unit, you should ensure that you have carried enough batteries. To avoid inconveniences, the best shower for camping should allow you to heat water using sunlight. The best thing about all the products we have reviewed on this list is that they meet all the necessary requirements. You can click the product links to check their reviews. Look for any of them now.